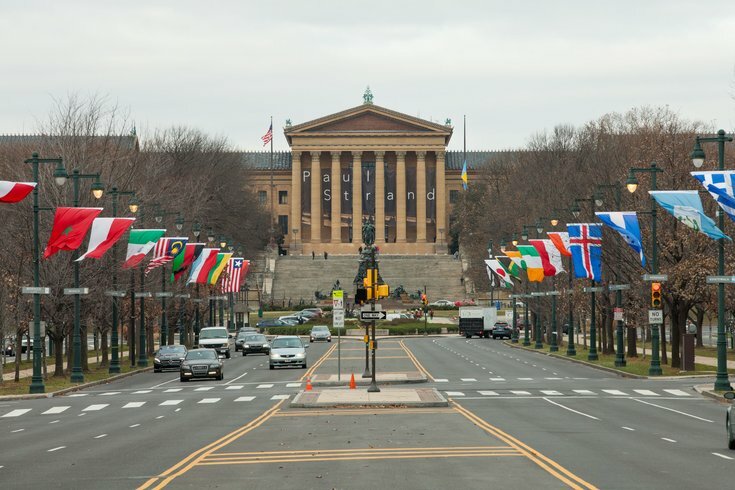 The Philadelphia Museum of Art and the Benjamin Franklin Parkway. Preliminary plans for the papal visit in late September include a security perimeter stretching from Girard Avenue to South Street and from the Schuylkill River to the Delaware River. Richard Dickson, executive director of the Philadelphia Parking Authority, stressed the details are subject to change when addressing the PPA board Wednesday, according to PlanPhilly.com. Parts of University City extending to 38th Street also could be included within the security perimeter. SEPTA bus service will not run through Center City, requiring some routes to be suspended or truncated, Dickson said. He noted the city is unlikely to operate normally the Friday before the papal weekend visit September 26 and 27, as the security perimeter is established and the city prepares for Pope Francis. About 50 Jumbotrons will be set up throughout the city to simulcast a Sunday mass on the Benjamin Franklin Parkway. Exactly what the security perimeter entails are unclear, PlanPhilly.com reported. But it may limit traffic to vehicles of residents and businesses located within it. It remains unclear whether the Benjamin Franklin Bridge will be open. Pope Francis is expected to speak at Independence Mall that Saturday before appearing at the Festival of Families on the Parkway later that night. He also will perform a Sunday afternoon mass on the Parkway, an event expected to draw more than 1 million people. Mayor Michael Nutter previously warned attendees that they better prepare to walk, saying the papal visit will be the largest event in modern Philadelphia history. "Be prepared to walk at least a few miles or more," Nutter said during a press conference in June. "Private vehicles are really not a viable option. Public transportation routes and schedules will be altered for efficiency and capacity purposes." In an effort to shuttle passengers into Center City as quickly as possible, SEPTA will require rail passengers to board trains from 31 select stations. All regional rail passengers must purchase one-day passes during the papal visit. When those tickets went on sale online Monday, the website crashed. SEPTA is deciding whether to switch website vendors before rolling out another sale.